"Great Kyrgyz uncertainty" is over. 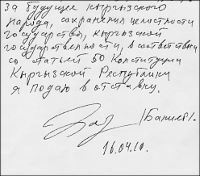 On April 15 ex-President of Kyrgyzstan Kurmanbek Bakiev signed the resignation statement and took off, taking his young children from his second wife, the fact, never officially reported earlier. Good thing is that the possible civil war between South and North, "Afghanisation", reflected in the analysis of experts, including Russian President Dmitry Medvedev, are over. The situation with dual power when current President Bakiev could not manage processes and interim government was not formally legitimized is resolved now. Many Kyrgyzstanis became anxious after the events of April 7, when 84 people were killed and 1500 people got injured. After the tragedy the citizens were concerned about the situation in Jalal-Abad Oblast, where Kurmanbek Bakiev, his brothers and ex-Minister for Defense were sheltered under the protection of few hundreds of armed people. The military assault would inevitably produce more victims. Prior to Bakiev’s resignation the mother of the man, killed on April 7, said she was ready to forgive Bakiev in order prevent further bloodshed. In the last days there was a possibility Kurmanbek Bakiev could split the republic into two parts. On April 7, 2010 we witnessed the coup in the Kyrgyz Republic. As a result of armed takeover we had the bloodshed among civilians while image of the state was severely damaged. All responsibility for these events is taken by the members of Interim Government that use them to take over the power. Realizing my responsibility for the events, I bring deep condolences to all families of killed people. Feeling my responsibility for the future of Kyrgyz people in these tragic days and in compliance with Article 50 of the Kyrgyz Republic Constitution I am resigning for the sake of the integrity of Kyrgyz people and Kyrgyz statehood. 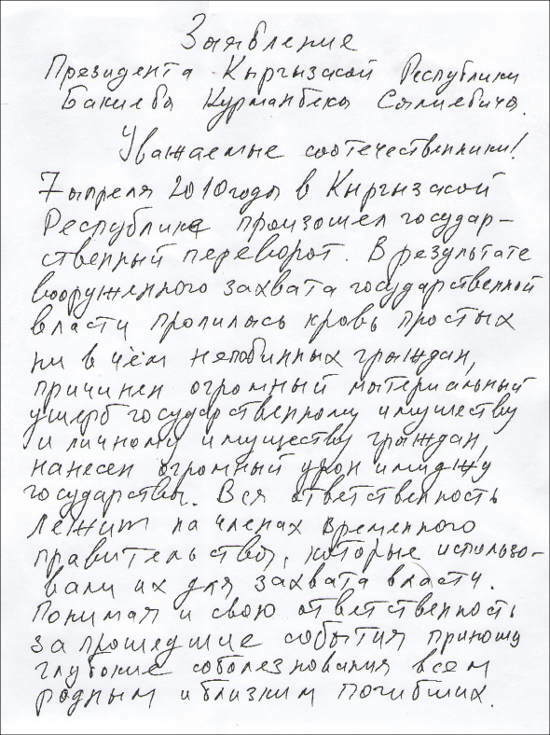 In the morning of April 16 all citizens of Kyrgyzstan will have to admit that the president of sovereign republic resigned under the pressure of people. Unlike in March of 2005 this time watching the video, showing the massacre of young men, it felt very bad to see those who blamed the protesters and those who rushed to get beneficial positions in the newly born government. Realizing the increasing gap between South and North, Kyrgyz people were happy to hear the news about the departure of Kurmanbek Bakiev. It was scary to see the armed men in Jalal-Abad. No one even wanted to think of possible consequences if the president kept resisting, proving his innocence and blaming the opponents. Ultimately, the unprecedented decision about the departure of Bakiev was made. There is "a small tragedy" of big Bakiev’s family in this story. He clearly knew that after his departure his brother Janysh will be detained and "punished" for his crimes. The point is that, having the immunity, Kurmanbek disappeared while Janysh stayed in Jalal-Abad. The authorities will take him: otherwise, the new government has no chances to justify itself before people. Who is this infernally brave Janysh Bakiev that stays in Kyrgyzstan unlike the president’s sons and other officials, close to President? The brothers of Kurmanbek Bakiev always competed with his sons for president’s attention. As a result, Kurmanbek’s brothers stayed with him till the end of this bloody story. Would Kurmanbek Bakiev ever think of such outcome when he appointed his brothers to high positions and made his son de facto the second highest official of the strict regime? 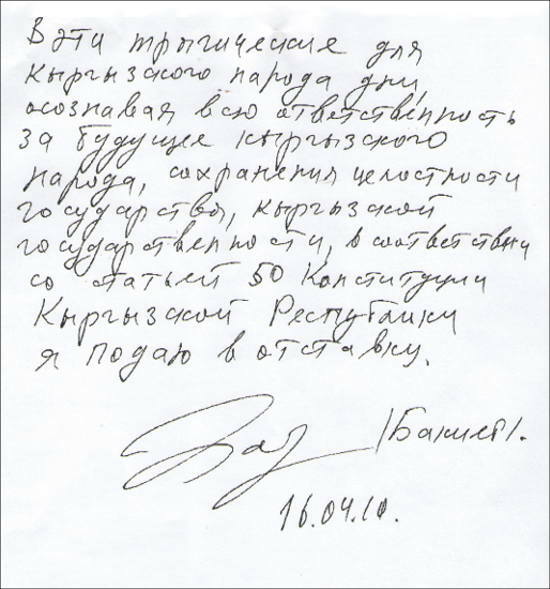 Janysh Bakiev had 100 chances to escape from Kyrgyzstan and die somewhere in the South America. However, he preferred to say good-bye to his brother and stay one-on-one with his destiny. At this moment he surely was thinking about the death of so many people and upcoming investigation and trial. What do people with "Bakiev" as the last name feel today? What is the destiny of those who were driving luxurious cars yesterday while today they may be imprisoned as Bakiev’s supporters? How does it feel for those who lost brother, son, father and friend in the main square of Bishkek when the sharpshooter took his life and dreams about the future? The journalists, occupying Bishkek and Jalal-Abad and catching every word of Kurmanbek Bakiev and interim government members, started booking tickets to go home. It is over. Arriving home they will forget about the events in Kyrgyzstan once they have other "hot" news in another country. On the other side, Kyrgyzstanis will not be able to forget about the recent massacre. At least thousands of flowers, brought to the fence of White House in Bishkek, will constantly remind about 84 people, shot down on April 7, 2010.